Essay Contest Theme: Who inspires, encourages or educates you on how to live well with kidney disease? Renal Support Network (RSN), a nonprofit, patient-organization that provides nonmedical services to those affected by chronic kidney disease (CKD), encourages people with kidney disease to encourage others by entering its 16th Annual Patient Essay Contest. RSN’s Annual Patient Essay Contest provides an outstanding opportunity for people who have chronic kidney disease, including people on dialysis and kidney transplant recipients, to make a valuable contribution to society by expressing their ideas, views, and most importantly, hope. 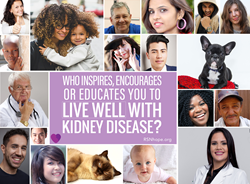 This year, the theme asks the writers to “Tell us about someone (Doctor, Nurse, Family member, Friend, Patient, Pet) who has inspired, encourage or educated you on how to live well with kidney disease.” All submissions must be written by someone who has been diagnosed with CKD." “This contest continues to prove that resilience is alive and well in the kidney community,” says Lori Hartwell, RSN's founder and president, who was diagnosed with kidney disease in 1968. Hartwell is the author of "Chronically Happy: Joyful Living in Spite of Chronic Illness", and the host of the KidneyTalk podcast. “People who are living with kidney disease know the value of sharing their experiences and inspiring their peers.” She added, “These stories provide hope for people who learn how to manage their disease and remain hopeful throughout their journey." Contest winners will receive cash prizes: First Place, $500; Second Place, $300; and Third Place, $100. The submission deadline is August 10, 2018. Winners will be announced on September 20, 2018, and winning essays will be featured in RSN’s publication Live & Give and on RSNHope.org. For information about the contest, rules and read previous winning essays, visit http://www.rsnhope.org/essay-contest. RSN would like to thank Fresenius Kidney Care, Keryx, the National Renal Administrators Association and U.S. Renal Care for their generous sponsorship and participation in the Essay Contest and their continuing support of RSN’s mission to make a lasting and positive difference in the lives of people who have kidney disease. The Renal Support Network (RSN) is a nonprofit patient-run organization that provides nonmedical services to those affected by chronic kidney disease. RSN strives to help patients (dialysis, kidney transplant, and newly diagnosed patients) develop their personal coping skills, special talents, and employability by educating and empowering them to take control of the course and management of the disease. http://www.RSNhope.org.